Update: These seasonal dishes are no longer available. Good food, great company and sharing of presents; Christmas is most certainly my favourite time of the year. A good place to host your Christmas get-together is Pizza Hut. 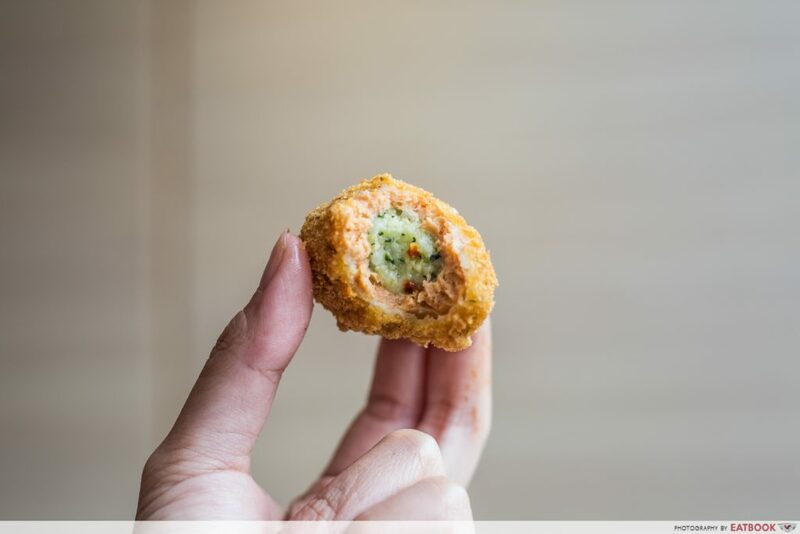 Pocket-friendly and loved by everyone both young and old, this household name has seen many fond memories being created at their restaurants. Before my sister and I moved out, my family used to visit Pizza Hut all the time for Christmas. We had this cute tradition where on the count of three, we would split apart the pizza to symbolise we were breaking bread. Oh, how I miss those times! 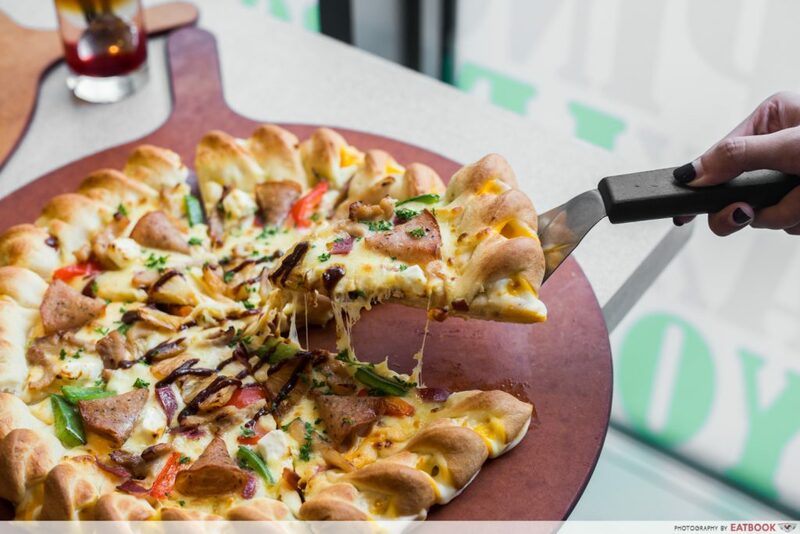 This festive season, they have stepped up their game with a selection of indulgent sharing platters and Knotty Cheesy pizzas that everyone will enjoy. A feast is not a feast without a wide variety of sides to complement your meal. 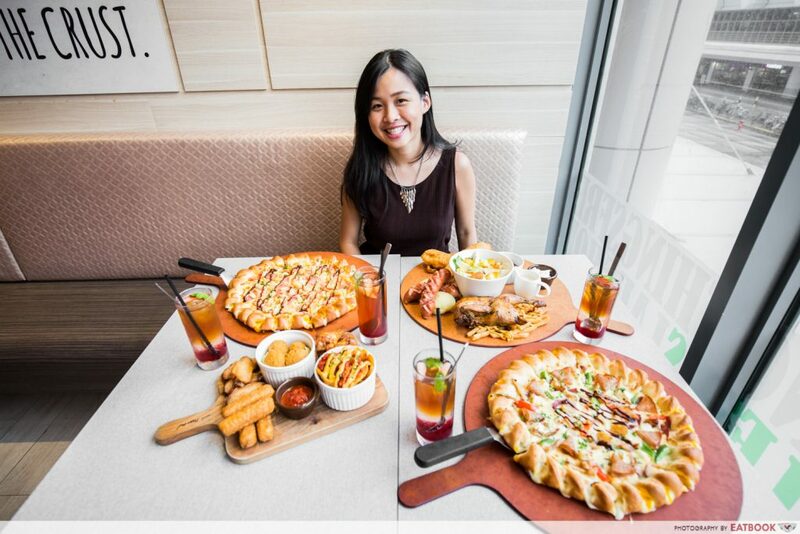 Pizza Hut’s Big Appetizer Platter (additional $15.90++ with every order) is certainly a grand starter to rev up your appetite for the lavish spread to come. 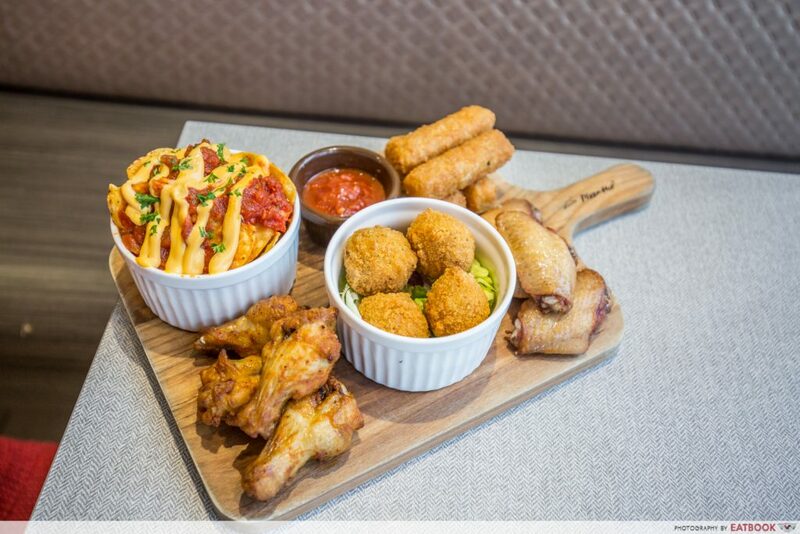 Ideal for two to four hungry revelers, this hearty sharing dish comes with all of Pizza Hut’s best-selling sides: Honey Roasted Wings, Sweet ‘N’ Spicy Drumlets, Nachos with Bolognaise, Salmon Croquette, and Mozzarella Sticks. Trust me when I say you need to start with the salmon croquette. 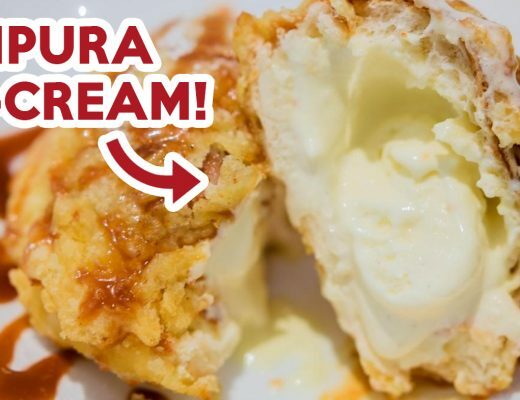 The crispy, bite-sized ball gives a surprising burst of gooey mozzarella goodness when you pop it into your mouth. 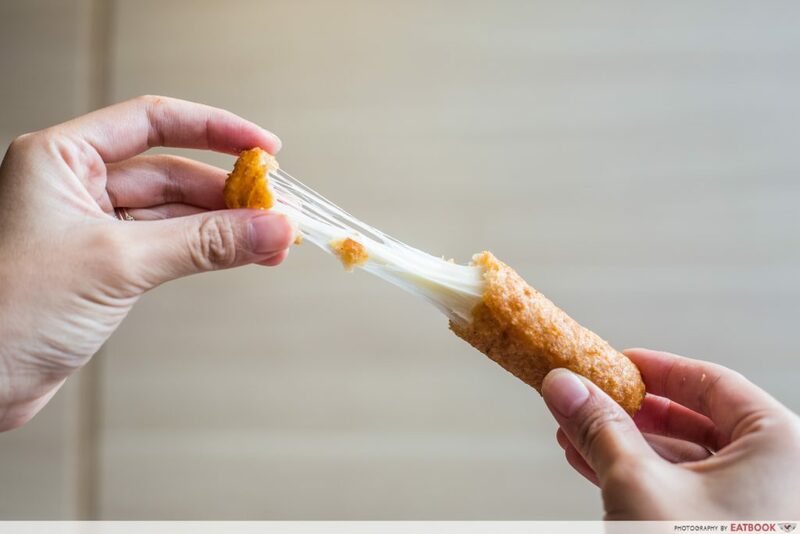 And while I know better than to play with food, I couldn’t resist giving their mozzarella stick a massive string-cheese pull. 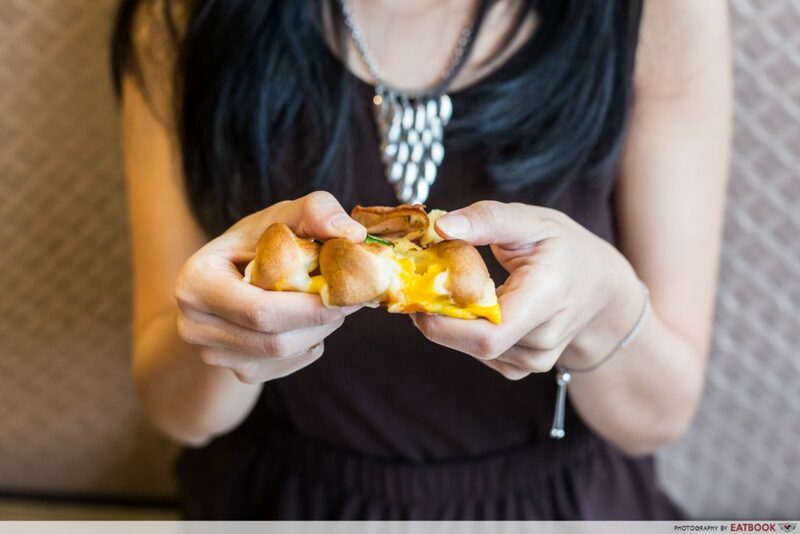 There’s just something so gratifying about melted cheese being stretched. Hawaiian pizza has, and will always be, one of my favourite pizza flavours. It’s like the quintessential pizza to order for any party and never fails to be wiped out within seconds. So I was glad this familiar favourite came as a Knotty Cheesy Hawaiian ($26.90++ for regular, $32.90++ for large). 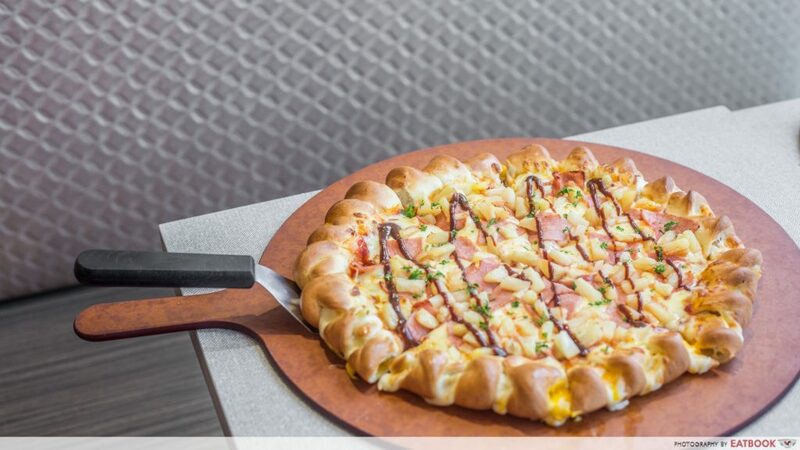 The all-time best-seller now features a beautiful golden knotted cheese-stuffed crust filled with parmesan and cheddar-flavoured mozzarella to go along with the chicken ham, pineapple topping, and BBQ sauce. If you’re looking for something more extravagant this Christmas, try the Knotty Cheesy BBQ ($26.90++ for regular, $32.90++ for large). Loaded with ingredients including Italian herb baked chicken ham, roasted chicken, and dollops of luscious cream cheese, the pizza was big on taste and had me pausing to relish each bite. It had an excellent ratio of sauce to cheese to toppings, so everything balanced out perfectly. I also loved how the cream cheese toppings married perfectly with the BBQ sauce, delivering a salty-sweet tang. The roasted chicken strips were also not dry, but moist and carried the sauce well. Make merry memories with your loved ones over this scrumptious Christmas Platter ($39.90++) that can feed a family of four. 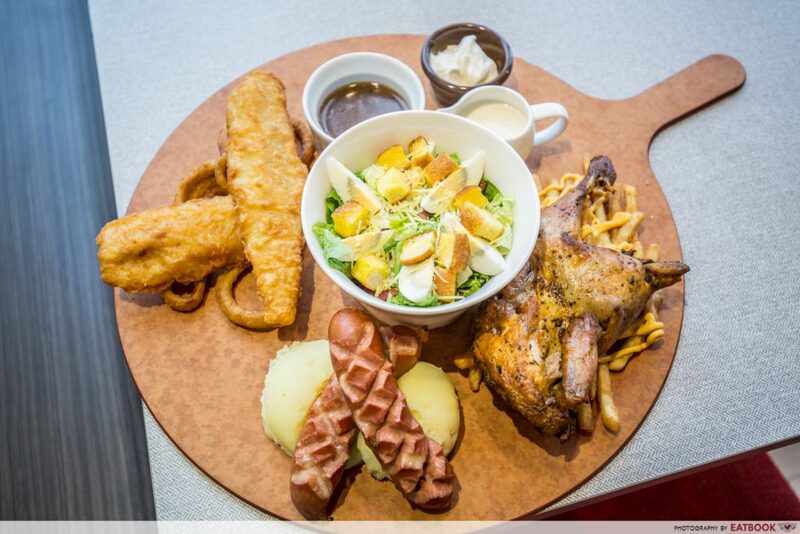 Coming with half a well-marinated roasted spring chicken, tempura battered fish, crunchy onion rings, crispy cheese fries, juicy chicken gouda cheese sausages atop creamy mashed potatoes, and Hut’s Caesar salad, this massive platter garnered plenty of ‘oohs’ and ‘aahs’ when it reached our table. And even though they were real liberal with their portions, the platter was so good, there wasn’t any “paiseh piece” left, leaving my three colleagues and I feeling as stuffed as a turducken by the end of it. 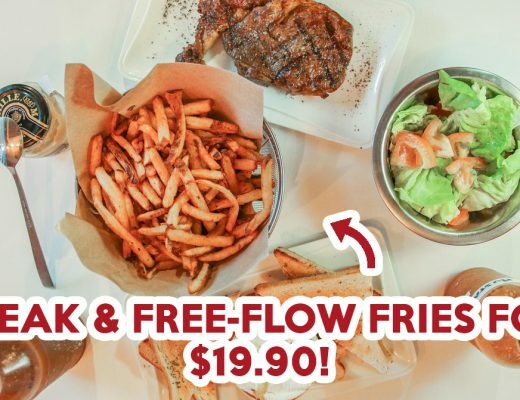 If you’re jio-ing your whole squad here, get the best of everything while giving your wallet a break with their Jolly Feast ($65.90++). 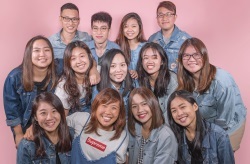 Comprising one regular Knotty Cheesy Pizza of your choice, the Christmas Platter, four bowls of their soup of the day, and four glasses of French Berry Iced Tea, this generous bundle deal can fill up even those with a monster appetite. 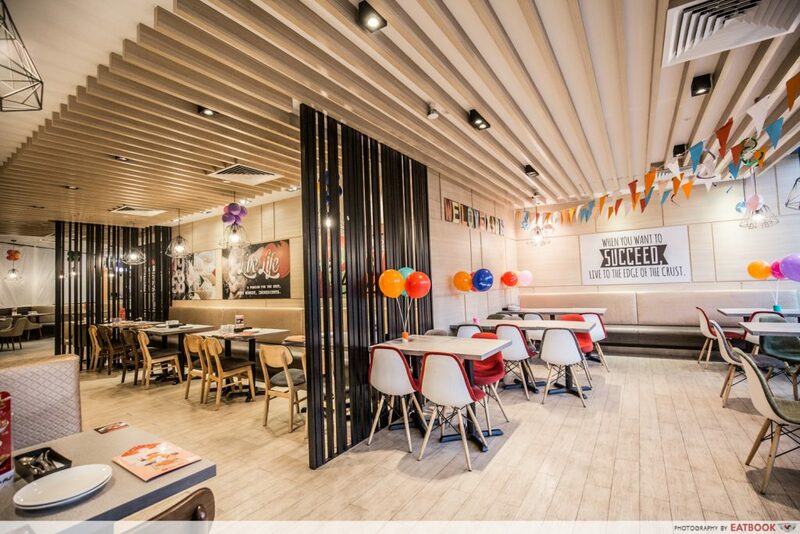 Boasting Scandinavian fittings and a pleasant neutral palette, Pizza Hut at Eastpoint Mall has a hip and inviting vibe that’s suitable for family gatherings as well as meetups with my cool squad. The spacious layout also makes it easy to accommodate a large group, and it can easily hold a party for more than 30 people. If you’re hosting a mini-gathering, do request for this semi-private area at the back, which isn’t visible from most parts of the restaurant. The space is real cosy and the cute quote on the wall makes for a pretty backdrop for a wefie! 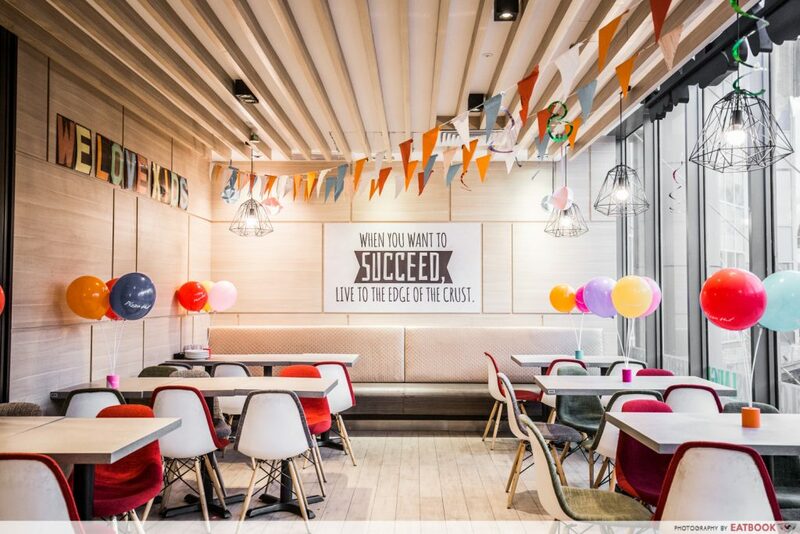 Together with the Eames-inspired chairs and industrial Edison-style lights, this restaurant is the epitome of chic. To me, Christmas is a joyous occasion that’s all about sharing and having an honest meal with the people closest to you, and Pizza Hut is a great place to do just that. 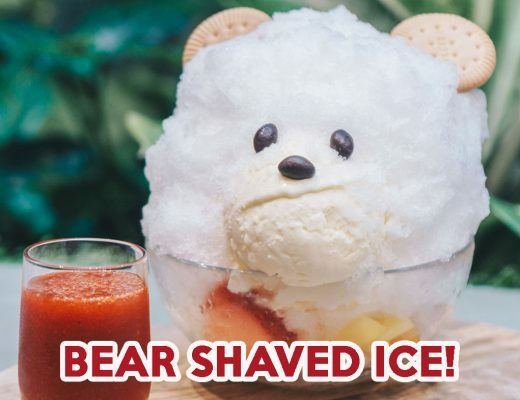 Their Christmas specials are all designed to be shared, which I really appreciate as I tend to have trouble deciding on what to order and share with my friends. 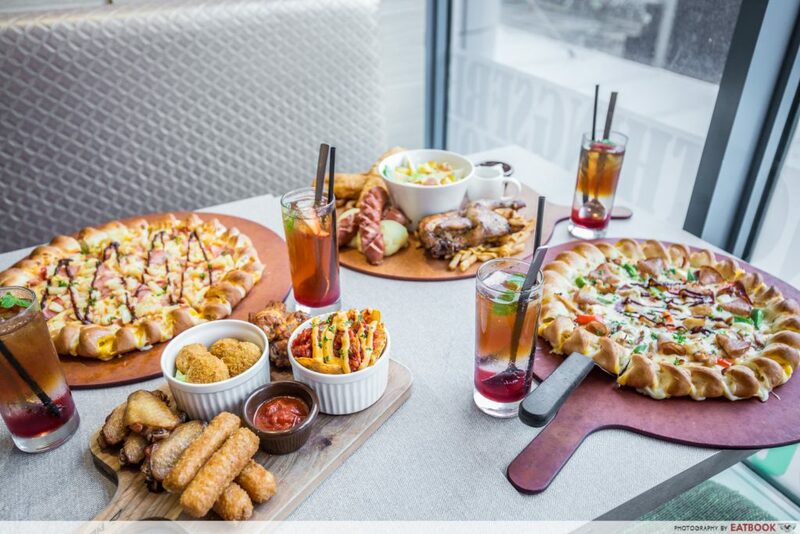 Everything, from the items on the platter to the toppings on the pizza, are classic Western favourites that are well-received even by the fussiest of eaters, assuring everyone will enjoy a meal here. In the Christmas spirit of giving, Pizza Hut will be donating $0.50 to the Children’s Cancer Foundation for every Knotty Cheesy Pizza sold – both for dine-in and delivery orders! All the more reason to come here for a Christmas pizza party. This article is brought to you by Pizza Hut.